Good news for all Android users, the widely popular Prisma Photo Filter App is out of beta and now available to all on the Play Store. Prisma Photo Filter App, which was trending on iOS over a month, was released a beta version for Android recently. The app has been available in beta on Android only for five days, so this is surprisingly quick that we get an official release so soon. The Prisma app transforms your pictures into art pieces using the styles of famous artists like Picasso, Munk as well as world famous ornaments and patterns. Prisma is quite popular among iPhone users and already topping iOS charts for a couple of weeks. If you are a fan of the app then Download Prisma Photo Filter App for Android from below. Prisma and Pokemon Go was the trending topics of last week. And Official Prisma Photo Filer app apk is now available for Android phones. The company released the first beta app for Android. But now no need to download beta version or sign up for beta because the official app is finally here. You can download Prisma Photo Filter App for Android from below. The Prisma Photo Filter App is available for which weighs 7 MB and requires Android 4.1 KitKat OS and later versions to run. The UI of the app is very simple and clean. Users can simply choose an image from their device or use their phone front or rear cameras to editing the pic. Users get a total of 36 filters. Applying the filter to images is very easy all you have to click on the art, users can also control the intensity of the filter. Prisma for iOS was already available, and you can download Prisma Photo Filer App for Android from below. Prisma app for Android contain all features as iOS. 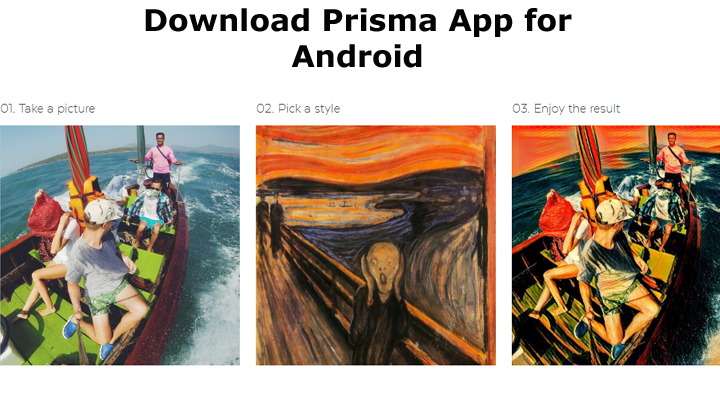 And the company also mentioned bringing Prisma Video feature, 360-degree Prisma images and an extensive list of new feature and styles to make your selfies cool. Download Prisma Photo Filtering apk from below. So download the Prisma App and share it with your friends.